Okay so another fad has hit the market promising weight loss and a step in the right direction for your health. Could it be that this one can actually deliver on its promises. Better yet, could it be that this fad is actually….healthy? I’m not talking a carbless diet or a water cleanse that leaves you tired and hungry 24/7. Nope, this fad will leave you feeling full, jump start your metabolism, ensure your daily allotment of nutrients, all while helping you lose weight. The best part is, it can actually taste good! So what is this fad I’m talking about? Juicing! So what exactly are the numerous benefits of juicing that everyone is talking about? Ensuring your daily nutrients: When you consume a whole fruit or vegetable your body has to work to break it down into its essential parts, absorbing what it can and excreting what it can’t, and often times excreting some valuable nutrients as well. Juicing, on the other hand, makes it much easier for the body to absorb nutrients because juicing breaks the food down for the body. This means the body doesn’t have to waste time breaking foods down. Instead, the body can immediately start absorbing all the vitamins, nutrients, phytonutrients, carbohydrates, amino acids, and more from the already broken down foods. Ensuring your daily vegetable and fruit intake: According to the USDA’s MyPyramid, those who should consume about 2,000 calories daily should consume 2 cups of fruit, 3 cups a week of starchy vegetables, and 6 ½ cups a week of other vegetables. That’s a daunting number of fruit and vegetables if you were to picture cutting it all up and serving it on a plate. However, by juicing these same fresh fruits and vegetables it is MUCH easier to obtain your daily servings. In fact, just ¾ a cup of fresh juice equals one daily serving of fruits or vegetables. Ensuring your daily fiber: As mentioned in the previous weeks posting, fiber provides several essential benefits for the diet and can be found in several food forms, especially fruits and vegetables. Juicing allows the body to easily absorb soluble fiber. It’s important to remember though that just because you are juicing, doesn’t mean you don’t need ANY fresh whole and raw fruits or veggies. Juice doesn’t provide the insoluble fiber that the whole forms of fruits and veggies do so it’s important to keep your diet well balanced. Ensuring your antioxidants: Eating your daily servings of fruits and vegetables also means you are getting your daily serving of antioxidants, which can help boost your immune system and fight against diseases as well as cleanse the body of nasty toxins. Saving you time: Think about cutting 3 cups of vegetables and 2 cups of fruit up and storing it away to eat throughout the day. That would take quite some time don’t you think? With a juicer, you can simply put an entire stalk of celery in the machine and before you know it, BOOM, it’s done! Offering more options: Everyone has tried reading and sticking to strict diet recipes and guidelines. It’s a lot harder than you might think. Losing motivation can be a diet killer and nothing quashes motivation more than lack of variety. 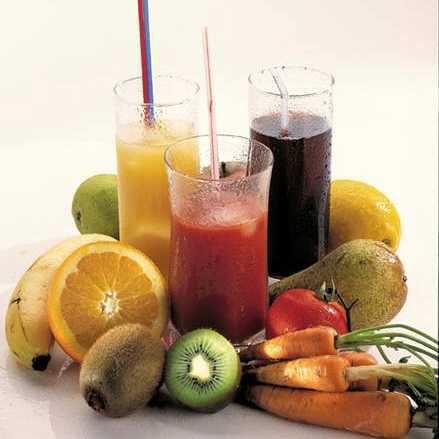 With juicing, you can choose which fruits and vegetables to add to each mixture depending on personal tastes. While this may still seem rather limiting since you can only add fruits, vegetables, and legumes, think of it this way: there are so many different fruits and vegetables to choose from at farmers markets and grocery stores that you can literally try thousands of different concoctions and never get bored!! If you don’t like a particular vegetable by itself but know it has insane health benefits, try mixing it with a veggie you love. Mixing and matching can result in new and potentially delicious tastes. There are so many more benefits to juicing beyond what I mentioned above. However, all the benefits aside, it is important to note that vegetables and fruits don’t supply your body with all the necessities to provide a complete and healthy diet. You still need protein and essential fats along with other things found in meats and other food forms that can’t be juiced to maintain a healthy diet. In other words, I’m saying juicing should be used in addition to a healthy diet, not in replacement of one! It is simply to aid in the absorption of nutrients, and to ensure you’re daily allotment of fruits and vegetables is being met. I highly recommend finding a book on juicing that suits your particular needs and exploring the matter further. Juicing is an intriguing world and can be rather tasty once you get into it. Good luck! This entry was posted in Nutrition Facts and Tips and tagged detox, Diet, fruit, juicing, smoothie, vegetables. Bookmark the permalink.